Austurvöllur is not only Reykjavík's go-to sunbathing spot, but it has also played an important role in Iceland's history. Located in central 101 Reykjavík, this public park is considered the midmost point of the downtown. On sunny days locals will flock to Austurvöllur Public Park for a picnic, a beer with friends and bathing in the sun. Some choose to sit on the grass, while others have no other options since the cafés surrounding the square are completely packed. But Austurvöllur has also played an important role in Iceland's history. Located by the square is Alþingi, Iceland's parliament. Every year, politicians and ministers walk from Dómkirkjan Church as a ceremonial "opening" of the parliament. This has often been the stage for mostly peaceful protest. After the financial crash of 2008, Austurvöllur was the main location for "Pots and Pans Revolution". In the center of the square a statue of Jón Sigurðsson can be found. Jón is Iceland's National Hero, every year on June 17th, which happens to be his birthday, Icelanders pay their respect to him. 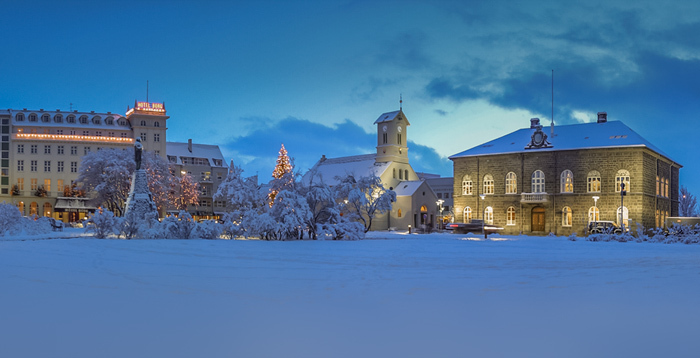 In December the mayor of Reykjavík lights up the Oslo Christmas Tree, a ceremony which marks the beginning of the Christmas season for many Reykjavíkans. Austurvöllur is often featured in walking tours of Reykjavík, where visitors can dig deeper into Icelandic history and culture.